Total anomalous pulmonary venous connection (TAPVC) consists of an abnormality of blood flow in which all 4 pulmonary veins drain into systemic veins or the right atrium with or without pulmonary venous obstruction. Systemic and pulmonary venous blood mix in the right atrium. An atrial defect or foramen ovale (part of the complex) is important in left ventricular output both in fetal and in newborn circulation. See the image below. Types of total anomalous pulmonary venous connection. Early in the formation of the lungs, the blood coming from the lung buds drains to the splanchnic plexus, which connects to the paired common cardinal and umbilicovitelline veins. The right common cardinal system later evolves into the right sinus venosus, which, in turn, becomes the right superior vena cava and azygos vein. The left common cardinal vein evolves into the left sinus venosus, which, in turn, becomes the left superior vena cava and coronary sinus. The umbilicovitelline system becomes the inferior vena cava, ductus venosus, and portal vein. At 25-27 days' gestation, the developing pulmonary venous plexus retains connections to the right superior vena cava, left superior vena cava, and portal system. No direct communication to the left atrium exists. At 27-29 days' gestation, the primitive pulmonary vein appears as an endothelial out-pouching from either the posterior superior left atrial wall or from the central part of the sinus venosus proximal to the primordial lung venous plexus. Connection between the primitive pulmonary vein and pulmonary venous plexus occurs by 30 days' gestation. The common pulmonary vein enlarges and incorporates into the left atrium, and, normally, the pulmonary venous part of the splanchnic plexus gradually loses its connection with the cardinal and umbilicovitelline veins. Because all pulmonary venous return connects to the systemic venous system, right atrial and right ventricular enlargement occurs, and, if significant pulmonary venous obstruction develops, right ventricular hypertrophy occurs. Total anomalous pulmonary venous connection occurs alone in two thirds of patients and occurs as part of a group of heart defects (eg, heterotaxy syndromes) in approximately one third of patients. Darling proposed the most commonly used classification system for total anomalous pulmonary venous connection based on the site of pulmonary venous drainage. In type I (ie, supracardiac connection), the 4 pulmonary veins drain via a common vein into the right superior vena cava, left superior vena cava, or their tributaries. In type II (ie, cardiac connection), the pulmonary veins connect directly to the right heart (eg, coronary sinus or directly to the right atrium). In type III (ie, infradiaphragmatic connection), the common pulmonary vein travels down anterior to the esophagus through the diaphragm to connect to the portal venous system. In type IV (ie, mixed connections), the right and left pulmonary veins drain to different sites (eg, left pulmonary veins into the left vertical vein to the left innominate, right pulmonary veins directly into the right atrium or coronary sinus). Pulmonary venous obstruction may occur in all types of anomalous connections, and, in all cases, clinicians must identify any sites of obstruction and treat the obstruction whenever possible at the time of surgical repair. In supracardiac connections, obstruction may occur at the origin of the ascending (vertical) vein or its attachment to the innominate vein, or the vertical vein may be obstructed as it crosses between the left pulmonary artery and the left bronchus. 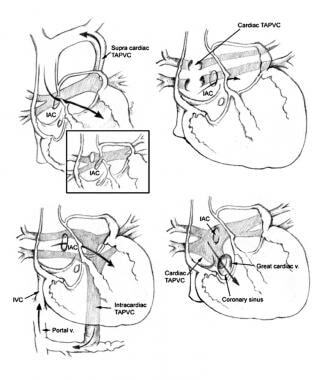 In cardiac connections, obstruction to pulmonary veins seldom develops but may occur at the junction of the common vein to the coronary sinus. In infradiaphragmatic connections, severe obstruction almost always inhibits pulmonary venous flow with obstruction of the common pulmonary vein. This obstruction occurs either as it travels through the diaphragm, at its junction with the portal vein system, or as an obstruction of pulmonary venous flow as the ductus venosus closes and pulmonary vein flow is forced to cross the liver portal sinusoid system. Finally, in all types, obstruction may occur because of restrictive atrial septal defect size and because of small left atrial size. As a result of the mixture of pulmonary and systemic venous flow, right atrial and right ventricular volume loading develops in all patients with total anomalous pulmonary venous connection. Whether right heart pressure loading is also present depends primarily on whether restriction to flow occurs at the atrial septum or an obstruction to pulmonary venous flow develops. If the foramen ovale is restrictive, right atrial pressure elevates, and systemic and pulmonary venous congestion both occur. Pulmonary blood flow increases, and pulmonary artery hypertension may occur. The left atrium and left ventricle receive less than the normal flow and pump less than the normal volume, with some decrease in the cardiac index. Most patients with isolated total anomalous pulmonary venous connection have a patent foramen ovale with some degree of restriction to transatrial flow. If no pulmonary venous obstruction is present, pulmonary blood flow increases (eg, 3-5 times the systemic volume) in early infancy, and arterial oxygen saturation is maintained, usually at 90% or higher. Signs of right heart volume load or right heart failure are evident. If obstruction of pulmonary venous flow is present, then pulmonary venous congestion occurs with increased pulmonary lymphatic flow and increased flow through available alternate pulmonary venous pathways. Reflex pulmonary arterial vasoconstriction may also occur. Increase in pulmonary vascular resistance leads to decrease in pulmonary blood flow and a lower volume of saturated blood in the venous mixture. Decrease in systemic oxygen saturation along with a decrease in the cardiac index may lead to a severe decrease in oxygen delivery. Total anomalous pulmonary venous connection occurred in 41 of 2659 cases with cardiovascular abnormalities in the Baltimore-Washington Infant Study (1981-1987) or in 1.5% of all patients with cardiovascular malformations. Regional prevalence was 6.8 per 100,000 live births. A total of 68% of these patients were diagnosed as neonates. In the Baltimore-Washington Infant Study, the male-to-female ratio was 18:23. In other reports, a strong male preponderance of 3:1 was observed in patients with infradiaphragmatic drainage. Seale A, Carvalho J, Gardiner H, Mellander M, Roughton M, Simpson J, et al. Total anomalous pulmonary venous connection: impact of prenatal diagnosis. Ultrasound Obstet Gynecol. 2012 Jan 20. [Medline]. Douglas YL, Jongbloed MR, den Hartog WC, Bartelings MM, Bogers AJ, Ebels T. Pulmonary vein and atrial wall pathology in human total anomalous pulmonary venous connection. Int J Cardiol. 2009 May 29. 134(3):302-12. [Medline]. Correa-Villasenor A, Ferencz C, Boughman JA, Neill CA. Total anomalous pulmonary venous return: familial and environmental factors. The Baltimore-Washington Infant Study Group. Teratology. 1991 Oct. 44(4):415-28. [Medline]. Khan MS, Bryant R 3rd, Kim SH, et al. Contemporary outcomes of surgical repair of total anomalous pulmonary venous connection in patients with heterotaxy syndrome. Ann Thorac Surg. 2015 Apr 23. [Medline]. Mackie AS, Vatanpour S, Alton GY, et al, for the Western Canadian Complex Pediatric Therapies Program Follow-Up Group. Clinical outcome score predicts adverse neurodevelopmental outcome after infant heart surgery. Ann Thorac Surg. 2015 Apr 22. [Medline]. Devaney EJ, Chang AC, Ohye RG, Bove EL. Management of congenital and acquired pulmonary vein stenosis. Ann Thorac Surg. 2006 Mar. 81(3):992-5; discussion 995-6. [Medline]. Chowdhury UK, Airan B, Malhotra A, Bisoi AK, Saxena A, Kothari SS. Mixed total anomalous pulmonary venous connection: anatomic variations, surgical approach, techniques, and results. J Thorac Cardiovasc Surg. 2008 Jan. 135(1):106-16, 116.e1-5. [Medline]. Yap SH, Anania N, Alboliras ET, Lilien LD. Reversed differential cyanosis in the newborn: a clinical finding in the supracardiac total anomalous pulmonary venous connection. Pediatr Cardiol. 2009 Apr. 30(3):359-62. [Medline]. Kyser JP, Bengur AR, Siwik ES. Preoperative palliation of newborn obstructed total anomalous pulmonary venous connection by endovascular stent placement. Catheter Cardiovasc Interv. 2006 Mar. 67(3):473-6. [Medline]. Narula N, Wilson N, Kumar RS. Transcatheter closure of persistent unligated vertical vein after TAPVC surgery using the Amplatzer PDA device. Catheter Cardiovasc Interv. 2007 Jul 1. 70(1):117-9. [Medline]. Kobayashi D, Forbes TJ, Delius RE, Aggarwal S. Amplatzer vascular plug for transcatheter closure of persistent unligated vertical vein after repair of infracardiac total anomalous pulmonary venous connection. Catheter Cardiovasc Interv. 2012 Mar 15. [Medline]. Chang YY, Chang CI, Wang MJ, et al. The safe use of intraoperative transesophageal echocardiography in the management of total anomalous pulmonary venous connection in newborns and infants: a case series. Paediatr Anaesth. 2005 Nov. 15(11):939-43. [Medline]. Behrendt DM, Aberdeen E, Waterson DJ, Bonham-Carter RE. Total anomalous pulmonary venous drainage in infants. I. Clinical and hemodynamic findings, methods, and results of operation in 37 cases. Circulation. 1972 Aug. 46(2):347-56. [Medline]. Castenada AR, Jonas RA, Mayer JE, Hanley FL. Cardiac Surgery of the Neonate and Infant. Philadelphia, Pa: WB Saunders Co; 1994. 165. Cheung YF, Lun KS, Chau AK, Chiu CS. Fate of the unligated vertical vein after repair of supracardiac anomalous pulmonary venous connection. J Paediatr Child Health. 2005 Jul. 41(7):361-4. [Medline]. Choe YH, Lee HJ, Kim HS, Ko JK, Kim JE, Han JJ. MRI of total anomalous pulmonary venous connections. J Comput Assist Tomogr. 1994 Mar-Apr. 18(2):243-9. [Medline]. Craig JM, Darling RC, Rothney WB. Total pulmonary venous drainage into the right side of the heart; report of 17 autopsied cases not associated with other major cardiovascular anomalies. Lab Invest. 1957 Jan-Feb. 6(1):44-64. [Medline]. Duff DF, Nihill MR, McNamara DG. Infradiaphragmatic total anomalous pulmonary venous return. Review of clinical and pathological findings and results of operation in 28 cases. Br Heart J. 1977 Jun. 39(6):619-26. [Medline]. Edwards JE. Pathologic and developmental considerations in anomalous pulmonary venous connection. Proc Staff Meet Mayo Clin. 1953 Aug 26. 28(17):441-52. [Medline]. Graham TP Jr, Jarmakani JM, Canent RV Jr. Left heart volume characteristics with a right ventricular volume overload. Total anomalous pulmonary venous connection and large atrial septal defect. Circulation. 1972 Feb. 45(2):389-96. [Medline]. Hancock Friesen CL, Zurakowski D, Thiagarajan RR, et al. Total anomalous pulmonary venous connection: an analysis of current management strategies in a single institution. Ann Thorac Surg. 2005 Feb. 79(2):596-606; discussion 596-606. [Medline]. Haworth SG. Total anomalous pulmonary venous return. Prenatal damage to pulmonary vascular bed and extrapulmonary veins. Br Heart J. 1982 Dec. 48(6):513-24. [Medline]. Hong YK, Park YW, Ryu SJ, et al. Efficacy of MRI in complicated congenital heart disease with visceral heterotaxy syndrome. J Comput Assist Tomogr. 2000 Sep-Oct. 24(5):671-82. [Medline]. Huhta JC, Gutgesell HP, Nihill MR. Cross sectional echocardiographic diagnosis of total anomalous pulmonary venous connection. Br Heart J. 1985 May. 53(5):525-34. [Medline]. Jonas RA, Smolinsky A, Mayer JE, Castaneda AR. Obstructed pulmonary venous drainage with total anomalous pulmonary venous connection to the coronary sinus. Am J Cardiol. 1987 Feb 15. 59(5):431-5. [Medline]. Kimball TR, Weiss RG, Meyer RA, Daniels SR, Ryckman FC, Schwartz DC. Color flow mapping to document normal pulmonary venous return in neonates with persistent pulmonary hypertension being considered for extracorporeal membrane oxygenation. J Pediatr. 1989 Mar. 114(3):433-7. [Medline]. Kirshbom PM, Flynn TB, Clancy RR, et al. Late neurodevelopmental outcome after repair of total anomalous pulmonary venous connection. J Thorac Cardiovasc Surg. 2005 May. 129(5):1091-7. [Medline]. Lin SC, Teng RJ, Wang JK. Management of severe pulmonary hypertension in an infant with obstructed total anomalous pulmonary venous return using magnesium sulfate. Int J Cardiol. 1996 Oct 11. 56(2):131-5. [Medline]. Lucas RV, Anderson RC, Amplatz K, Adams P Jr, Edwards JE. Congenital causes of pulmonary venous obstruction. Pediatr Clin North Am. 1963 Aug. 10:781-836. [Medline]. Maeda K, Yamaki S, Kado H, Asou T, Murakami A, Takamoto S. Hypoplasia of the small pulmonary arteries in hypoplastic left heart syndrome with restrictive atrial septal defect. Circulation. 2004 Sep 14. 110(11 Suppl 1):II139-46. [Medline]. [Full Text]. Morin FC 3rd. Prostaglandin E1 opens the ductus venosus in the newborn lamb. Pediatr Res. 1987 Mar. 21(3):225-8. [Medline]. Emmanouilides GC, Gutgesell HP, Riemenschneider TA, Allen HD, eds. Moss and Adams Heart Disease in Infants, Children and Adolescents: Including the Fetus and Young Adult. 5th ed. Williams & Wilkins; 1995. 874-901. Neill CA. Development of the pulmonary veins; with reference to the embryology of anomalies of pulmonary venous return. Pediatrics. 1956 Dec. 18(6):880-7. [Medline]. Norwood WI, Hougen TJ, Castaneda AR. Total anomalous pulmonary venous connection: surgical considerations. Cardiovasc Clin. 1981. 11(2):353-64. [Medline]. Ricci M, Elliott M, Cohen GA, et al. Management of pulmonary venous obstruction after correction of TAPVC: risk factors for adverse outcome. Eur J Cardiothorac Surg. 2003 Jul. 24(1):28-36; discussion 36. [Medline]. Rosales AM, Bolivar J, Burke RP, Chang AC. Adverse hemodynamic effects observed with inhaled nitric oxide after surgical repair of total anomalous pulmonary venous return. Pediatr Cardiol. 1999 May-Jun. 20(3):224-6. [Medline]. Sahn DJ, Allen HD, Lange LW, Goldberg SJ. Cross-sectional echocardiographic diagnosis of the sites of total anomalous pulmonary venous drainage. Circulation. 1979 Dec. 60(6):1317-25. [Medline]. Sano S, Brawn WJ, Mee RB. Total anomalous pulmonary venous drainage. J Thorac Cardiovasc Surg. 1989 Jun. 97(6):886-92. [Medline]. Smallhorn JF, Sutherland GR, Tommasini G, Hunter S, Anderson RH, Macartney FJ. Assessment of total anomalous pulmonary venous connection by two-dimensional echocardiography. Br Heart J. 1981 Dec. 46(6):613-23. [Medline]. Solymar L, Sabel KG, Zetterqvist P. Total anomalous pulmonary venous connection in siblings. Report on three families. Acta Paediatr Scand. 1987 Jan. 76(1):124-7. [Medline]. Tasaka H, Krug EL, Markwald RR. Origin of the pulmonary venous orifice in the mouse and its relation to the morphogenesis of the sinus venosus, extracardiac mesenchyme (spina vestibuli), and atrium. Anat Rec. 1996 Sep. 246(1):107-13. [Medline]. Valsangiacomo ER, Hornberger LK, Barrea C, Smallhorn JF, Yoo SJ. Partial and total anomalous pulmonary venous connection in the fetus: two-dimensional and Doppler echocardiographic findings. Ultrasound Obstet Gynecol. 2003 Sep. 22(3):257-63. [Medline]. van der Velde ME, Parness IA, Colan SD, et al. Two-dimensional echocardiography in the pre- and postoperative management of totally anomalous pulmonary venous connection. J Am Coll Cardiol. 1991 Dec. 18(7):1746-51. [Medline]. Ward KE, Mullins CE. Anomalous pulmonary venous connections. The Science and Practice of Pediatric Cardiology. 2nd ed. Williams & Wilkins; 1998. Ward KE, Mullins CE, Huhta JC, Nihill MR, McNamara DG, Cooley DA. Restrictive interatrial communication in total anomalous pulmonary venous connection. Am J Cardiol. 1986 May 1. 57(13):1131-6. [Medline]. Wilson AD, Rao PS, Aeschlimann S. Normal fetal foramen flap and transatrial Doppler velocity pattern. J Am Soc Echocardiogr. 1990 Nov-Dec. 3(6):491-4. [Medline]. Disclosure: Received honoraria from Actelion for speaking and teaching. Fast Five Quiz: Can You Confront Heart Failure? Does Screening Newborns for Congenital Heart Disease Save Lives?